Pizza squeeze sauce… I was intrigued. My house-mates and I are quasi-foodies. We love food… cheap food, expensive food, exotic food, plain food. I say quasi because all of this is within reason, I don’t see any of us off to eat goat testicles in rice wine any time soon (it’s a real thing!). So the other day when L told me her favorite pizza sauce was “Pizza Squeeze” by Contadina I was a bit surprised. Usually anything you squeeze from a bottle is… well… the first thing that comes to mind is “Easy Cheese” =P. But knowing that L is a purveyor of great food I had to try this stuff out. When making pizza I really like the cheese brand vegan gourmet, which you can usually find at Whole Foods. It comes in block form, so you have to do the shredding yourself, but the end result is well worth it. This cheese actually melts and tastes like the real deal, because let’s be honest… a lot of substitutes don’t! When picking out the sausage be sure to buy fresh sausage so you can remove the casing. Processed sausage will retain it’s circle shape and doesn’t work as well. Inspired by Whole Foods recipes. Over medium heat, cook sausage in large frying pan with a little bit of olive oil spray. Sausage should be removed from casing and easy to break apart in small pieces by a wooden spoon. When sausage is no longer pink, remove from heat and set aside, roughly 10 min. Spread about 1/4 cup pizza squeeze over each piece of naan. Sprinkle mozzarella across all pieces until the block is finished. 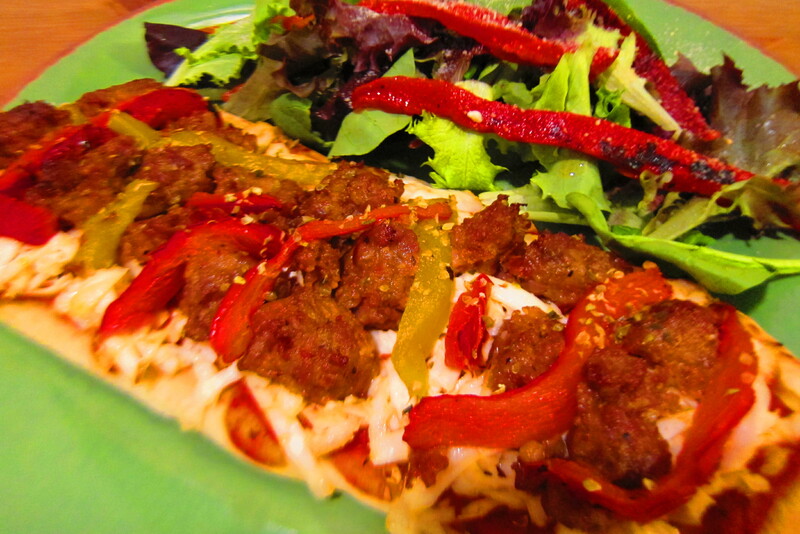 Place sausage and roasted red peppers strategically across pizzas. Sprinkle red pepper flakes and oregano on top. Bake 5-10 min or until cheese is clearly melted. (It will happen, I promise!) While pizza is cooking make salad dressing and arrange arugula on the plates topping with roasted red peppers and grated Topping. I have to say I was a fan of the squeeze. Not only was it the easiest way I’ve ever made a pizza but it tasted great too!